Line a flan ring or sandwich tin with the patry and bake it "blind". 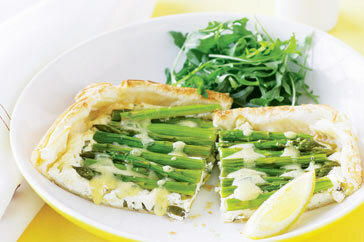 Arrange drained pieces of asparagus in the case, reserving a few for garnish. Melt the margarine and stir in the flour, cook for 1 minute, then add the milk gradually, stirring. Bring to boiling point and simmer, adding almost all the cheese. Pour the mixture over the asparagus and sprinkle with cheese. Brown under the grill and garnish with parsley.